When Saudi Arabia gets into games news here, it's usually for banning a game (which its citizens can readily obtain by other means), although it does have developers, who recently published an Uncharted clone. This weekend saw the nation's first gaming exposition, too, although a visit to its main page advises "Attendance for males only." [Clarification] While this is the first edition of TGXPO, the country has other expos. 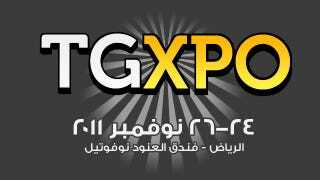 Much smaller in scale than the convention-center sized galas we're accustomed to in the U.S., TGXPO was held in a hotel in Riyadh. It still featured a Gears of War 3 and Ultimate Marvel vs. Capcom 3 tournament (whose grand prize was an Xbox 360 and Kinect). Microsoft also was an organizing sponsor. No word on cosplay, but if we hear of any photos, be assured they will be posted.